Learn more about the Collaboration Room. To reserve the room, visit this page , choose a date and time, and enter in your information. Need to meet with a small team to set the project’s priorities, do research, or just touch base? The Old Town, Harmony and Council Tree Libraries have study rooms that are great for quiet, informative meetings with your small team. Different sizes are available, some are first come first served sign up and some you can sign up for in advance. 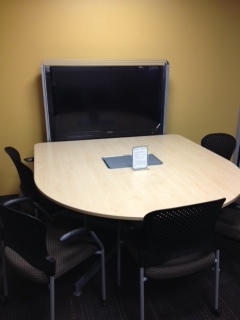 Click here for more information about study rooms at your library. Ready to reserve a room? Visit this page to pick a date and time. To find out more about the Community Rooms, click here . To reserve a room, visit this page . Call the Answer Center at 221-6740 with your questions on these rooms.